Most kids need a regular schedule. They get this during the day at school, but what about when they get home? You will want to develop your own after school routine that your kids can follow. Trust me; you will be thankful you did. There is a lot of great information out there to help make your morning routine go more smoothly (we’ve even got one HERE). However, what about after school? The kids come bursting through the door and then it seems that chaos begins. There are shoes, backpacks, homework, snacks. It all can quickly drive mom insane! The trick is to create an effective after-school routine, or schedule. When you have one, everyone knows what to do and can help keep a good rhythm running in your house. Of course, you may need to tailor this to each child, depending upon age and maturity. Even my own kids are different. That means the way I run our routine differs a bit for each of them. Find a location in your house where your child’s backpack will “live.” It could be a hook on the wall, in the hall closet or on the floor by the entryway. In our house, my kids put their backpacks on the bench in our hallway. To make the morning more efficient, have your child take his or her shoes off and set them near their backpack, or another place. That way, there is no rushing around the morning to find that sneaker that is hiding beneath their bed. Kids are usually hungry when they come walking through the door. Have a snack basket, filled with “mom approved” snacks ready for them. Whether it is right when they get home or later in the evening, give your kids some free time. It may mean playing outside, watching one TV program or limited time on a tablet. Kids need a chance to do what they want each day. For some families, kids must do their homework as soon as they walk through the door after school. For others, it happens after dinner time. There is no right or wrong time to do your homework. Find the time that works best for your family. Kids have things they need to do each day. It might be cleaning their room, unloading the dishwasher or taking out the trash. It may also include helping with dinner by setting the table and doing the dishes. It can be helpful to keep a list of chores displayed, so your child knows what he or she has to do each day. The above is a guide. You know your kids and your family’s routine. There may be days where you have practice or games that throw your after school schedule out of balance. Those are the days where you may need to be more flexible. It might be the day of the week when they get to skip the chores to allow more time for homework. While this is all great, it is good to help teach your kids how to do this themselves. My kids are very visual. They will do everything they see on a sign or a list much more frequently than they do if they have to remember on their own (or even if mom has to tell them). 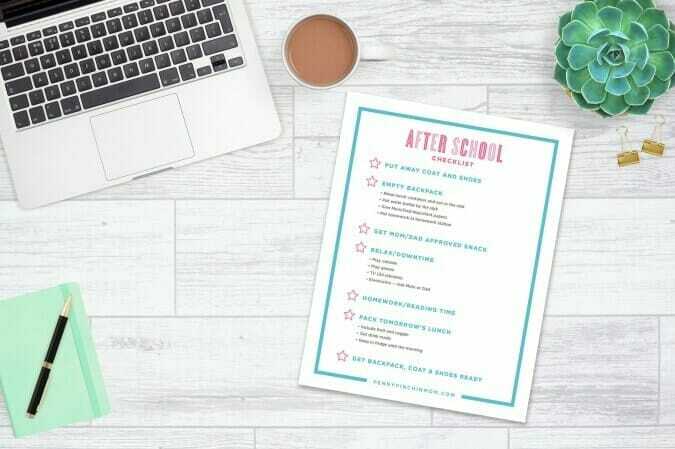 For this reason, I created a printable after school checklist. It is a simple way for them to remember what they need to do when they get home from school. We have ours hanging up in our pantry. This way, they see it when they grab their snack, so the remember everything they need to do. Laminate and attach it to the refrigerator with magnets. Put it in a photo frame and use a dry erase marker for them to check it off daily. Print out copies and give them a new one to use every single day (I’d print in black and white to save money on printer ink). Whatever you do, try to set a routine for your kids. They need to know what comes next and it really helps reduce stress (and even tears)!! Yes – they do that in the morning. I printed off the chart “This Weeks responsibilities” and now I can’t find it. Can you help me out? When you click on that it downloads to your computer. So, it would either save to your downloads folder or to your desktop. You can do a search for responsibilities on your computer and that may help you find it.